For as long as I can remember, I've always loved Mexican food. Good chips and salsa is definitely a weakness for me, no matter how much junk food I gave up, I don't think I could give up chips and salsa. When I don't know what to make for dinner and I need something fast, we inevitably have tacos. If I'm in a bad mood, my husband often suggests we go out for Mexican and I start to feel better. So it should come as no surprise that my experimenting often leads to Mexican-inspired flavors. I love adding spicy peppers, garlic, lime juice, cilantro, cumin, and other Mexican flavors to dishes. I love ordering tequila lime fajitas when we go out to dinner so I thought I would make my own at home. Of course I decided this while inviting friends over for dinner when walking around the grocery store at 4:30 pm on a Saturday. So I picked up some chicken, some garlic, limes, and a couple of jalapeno peppers. We didn't end up making it into fajitas that night but ate it with a salad and some grilled potatoes but I turned the leftover chicken into fajitas a couple nights later and it was fantastic with a little avocado, grilled bell peppers and onions and warm tortillas. You're going to want to make extra so you have leftovers of this - grill out on Sunday, make double and you're 90% done with a weeknight dinner. 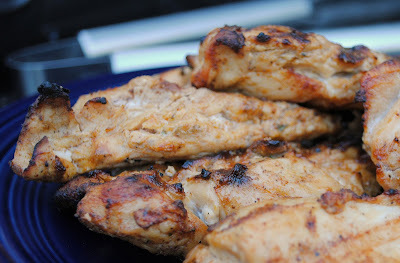 One more thing while I'm talking about chicken - I'm not sure about your grocery store, but whenever I buy boneless, skinless chicken breasts, the pieces are always huge. I generally remove the tender and butterfly each breast, so I have 2-3 pieces from each one. They cook up much faster and more evenly on the grill, so you don't end up with dried out chicken waiting on the middle to be done. It also helps make it easier to gauge one serving which is 3-4 ounces rather than a whole chicken breast. In a large ziploc freezer bag, combine all ingredients, except chicken. Shake to combine. Add chicken, making sure to distribute marinade over the chicken. Refrigerate about 1 hour. Preheat grill to medium heat. 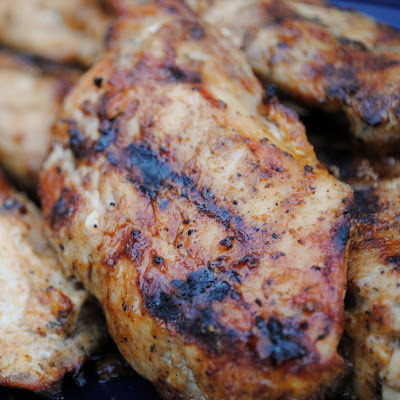 While grill heats, remove chicken from refrigerator and let stand at room temperature about 15 minutes. 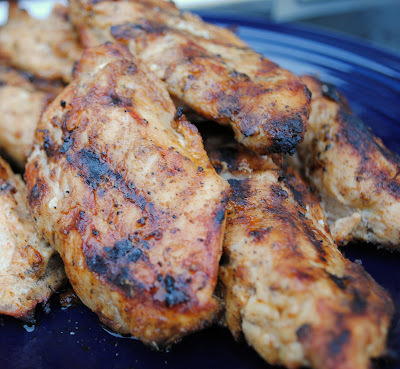 Spray grill with grilling spray or rub lightly with vegetable oil to prevent sticking. Add chicken and grill about 5 minutes on first side. Turn chicken and grill about 5 minutes more until cooked through. If chicken is sticking when you try to turn it the first time, give it another minute or so, it probably just isnt ready. Once cooked through, remove to a plate, cover tightly with foil and let stand for about 10 minutes so juices re-distribute. Serve as is or use for fajitas, in enchiladas, tacos, chicken rollups or for sandwiches or salads. This sounds delicious, I am always looking for some new fun chicken recipes.